Don’t leave opportunities on the table. On-Demand Leadership’s Negotiation Skills training will help you and your employees become more effective negotiators without resorting to a scorched earth policy that leaves the other party feeling cheated. Smart negotiators bring in good deals—but they also build solid relationships with crucial stakeholders like customers, suppliers, investors, and future employees. Want to win at all costs? See a psychologist. Want to create joint wins wherever possible? See On-Demand Leadership’s negotiation training. What are the benefits of attending a Negotiation Skills class? Many negotiations are extremely consequential. 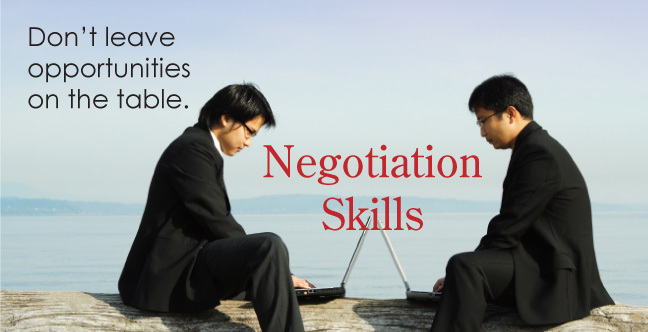 Negotiation skills training can help you make the most of them. We negotiate more often than we think, at work and at home, in scenarios of widely varying degrees of importance. Good negotiation skills can absolutely be taught. Experience counts, but not as much as a good plan, executed properly. Who should attend a Negotiation Skills class? Anyone who wants to become a better negotiator. People who hammer out contracts, proposals, or other deals. Entrepreneurs seeking tools to get the best deal possible. Anyone looking for usable tools to improve negotiation effectiveness and bargaining skills.